The article examines the state and prospects of organic production by agricultural enterprises in the Ukraine. Existing natural, climatic and soil potential for the production of organic agricultural products as well as their export and consumption in the domestic market are characterized. It was noted that the development of organic production is one of the main priorities of the agrarian sector of the Ukrainian economy. State support for the development of this type of production is being implemented, as reflected in ‘3 + 5’ as a strategy for the development of the agrarian sector of the economy for the period until 2020. Attention is drawn to the instability of the environment, insufficient development of demand and limitations of financial resources, which hinder the realization of Ukraine’s potential in this segment of the agrarian sector. 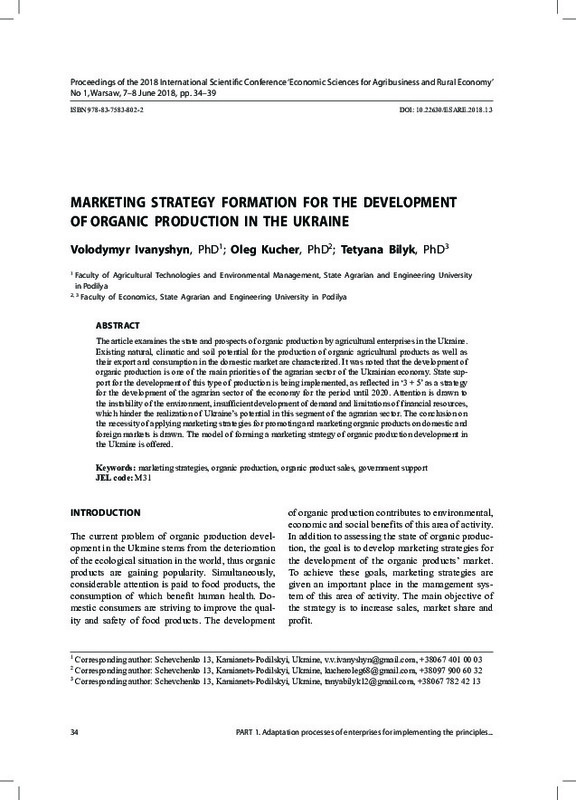 The conclusion on the necessity of applying marketing strategies for promoting and marketing organic products on domestic and foreign markets is drawn. The model of forming a marketing strategy of organic production development in the Ukraine is offered.